Ever thought, “I can’t do Capoeira, I can’t even do a cartwheel”? This post is for you! If you’re one of those people who’ve hesitated to do Capoeira because you think you’re not fit enough or you’re not this or that, then I have a few words for you. When I first started Capoeira, I was barely able to do a mediocre cartwheel to one side, and to the other, I was completely terrified. I could barely put my hand down and I had zero confidence that if I did put that hand down, it would keep me up and my head from hitting the floor. Within a few months that changed and not only did I have a cartwheel, but I felt much more confident and that big ego boost helped me believe that I could do well in Capoeira. In fact, like many people, I felt very intimidated by Capoeira and made a classic statement to myself even as I was years into practicing. I would tell myself, “I’ll learn this move, that move, this is ok, but I won’t learn this. I’ll never do that. Etc.”. I realize now how intimidated I was by people doing splits, singing, playing instruments, doing kicks in the air, and doing backflips. My teenage brain literally could not comprehend activities that did not include sitting in a desk and playing dodgeball for gym. Even most sports, which people associate with health and fitness are not nearly as demanding with the breathe of movement that Capoeira offers! For this blog post, I want to lay to rest some fears by giving you some activities and mental coaching that will help you get through whatever mental blocks you might have that keep you from accepting that you could be that person doing flips, singing, and all the rest of it. Here is a list of things to keep in mind as a beginner. It doesn’t matter if just took your first class or if this is your first month. The struggle is real whenever you try something new, and most people can relate to the feeling of being uncomfortable. Here are some tips that can help you get through that initial phase and rocket off to success. For most of us, we spend our days at a desk for school or for work. Even now, I’m typing at a desk because that just seems normal to us. We rarely move in a direction other than forwards and most importantly, we hardly ever touch the ground. The ground is something that’s always with us and yet our relationship with it is very distant. 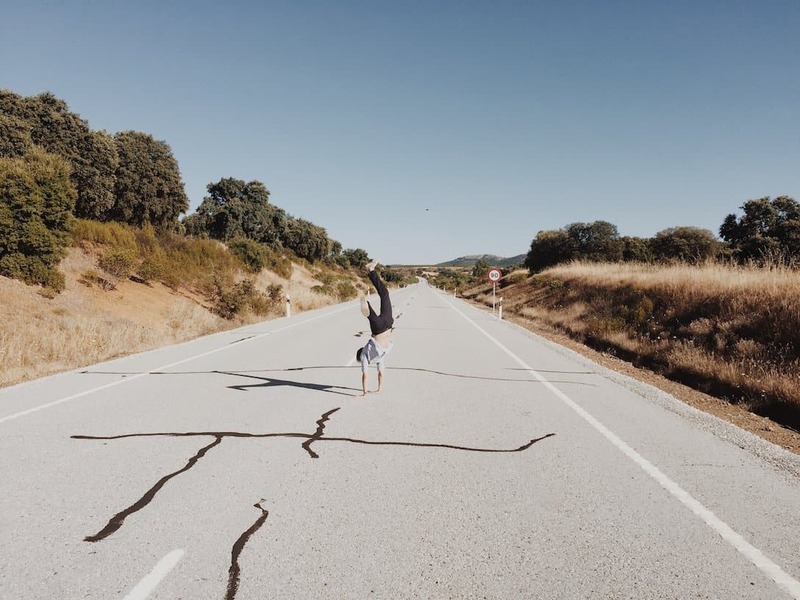 Going back to the story of not being comfortable doing a cartwheel, part of the reason is that we rarely move on the ground once we get a little older. It’s as though we got past crawling and never looked back, but there’s something there. Touch the ground, do it now. It can be hard, soft, clean, dirty, whatever. The point is that you build your relationship with the ground as well as you can because in Capoeira we move in all sorts of ways, and we need to be aware of the ground at all times. Something that helped me with the initial feeling of awkwardness was to ask people who have been practising for a few years how to do something that was confusing to me. Everyone was always helpful and showed me step by step how to do moves like a queixada or volta por cima. I always felt like I got a leg up on my Capoeira game, was able to reinforce lessons from class, and met someone new at the same time. Capoeira people have a reputation for being friendly, open, and hang out with each other more than other group classes and martial arts practitioners. People are generally nice and willing to teach you whatever you want, so ask away!!! Some questions to ask for the newbies: How do I do “x” move? How do I play “x” instrument? (if instruments are available), and How do I start a Capoeira game? An interesting thing about the body is that it can do more than you think. Skill acquisition starts in the brain, like a computer that downloads new software. Learning any new movement requires your brain to rewire itself in a way that activates that new skill. Take for example a student of mine who swore, “I can’t do a cartwheel [at all]”. During the lesson we practiced just that, cartwheels. The student went on vacation, and two weeks later came back for her second class. During that time she said she hadn’t practiced her cartwheels, but when she tried it again, there was a noticeable difference in her body’s ability to produce the movement. In other words, the mind downloaded the software, allowing her to realize more of her potential. This example is all to say one thing: “You can do much more than you think is possible”. You think you can’t do a backflip? Believe me, I’ve seen teenagers with the BMI of a 55 year old fantasy football nerd do them. You think you could never get in the roda and play a competent capoeira game with someone? Any improvement takes time, but people who have motivated themselves to get better, have done just that, and go on to be very impressive. So the next time you think you can’t do a cartwheel, just remember, you’re capable of much more than you think. The only thing left is for you to take a bet on YOURSELF and go for it.